Chevron – Anadarko Deal. Chevron announced plans Friday to acquire oil and gas exploration and production company Anadarko Petroleum in a cash and stock deal valued at $33 billion. The transaction will expand the second biggest U.S. energy company’s operations in shale oil and gas production, offshore drilling and liquefied natural gas exports. Shares of Anadarko rose 31% in the premarket trading following the news. Chevron shares were down 4.2% from Thursday’s close of $125.99 a share. The deal represents the 11th biggest ever for an energy and power company, according to Refinitiv. Chevron will have greatly expanded access to assets as a result of the combination. The deal comes as oil majors like Chevron and Exxon Mobil look to carve out a dominant position in the Permian Basin, the largest U.S. shale field and the driver of a boom in American oil production. Chevron’s Permian production of oil, natural gas and associated liquids hit 16.2 billion barrels of oil equivalent (BOE) in 2018. Anadarko produces about 4 billion BOE from the Permian region, which underlies western Texas and eastern New Mexico. That is at the heart of Chevron’s Permian strategy. The company is bringing industrial scale to shale drilling, once the domain of small, independent wildcatters. Both companies are also offshore players in the Gulf of Mexico. Anadarko currently operates 10 offshore facilities in the Gulf, which Chevron says will enhance its presence in the region. The deal gives Chevron a stronger foothold in the African liquefied natural gas market. Anadarko plans to build one of the world’s largest LNG export facilities in the world in Mozambique, leveraging huge natural gas reserves from nearby offshore fields. Demand for LNG — natural gas chilled to liquid form for transport by sea — is soaring as countries like China aim to meet their energy needs with gas, which. NGL Constraints in the Appalachian Basin. 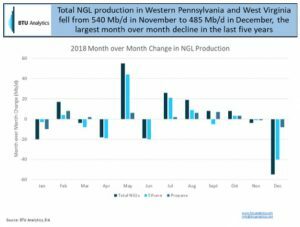 (Thank you, BTU Analytics) A perfect storm of outage-driven constraints continues to disrupt supply in the Marcellus and Utica. The outages resulted in natural gas liquids supply dropping by an unprecedented 55 Mb/d month over month in December. The outages highlight the fragility of liquids infrastructure in Appalachia. 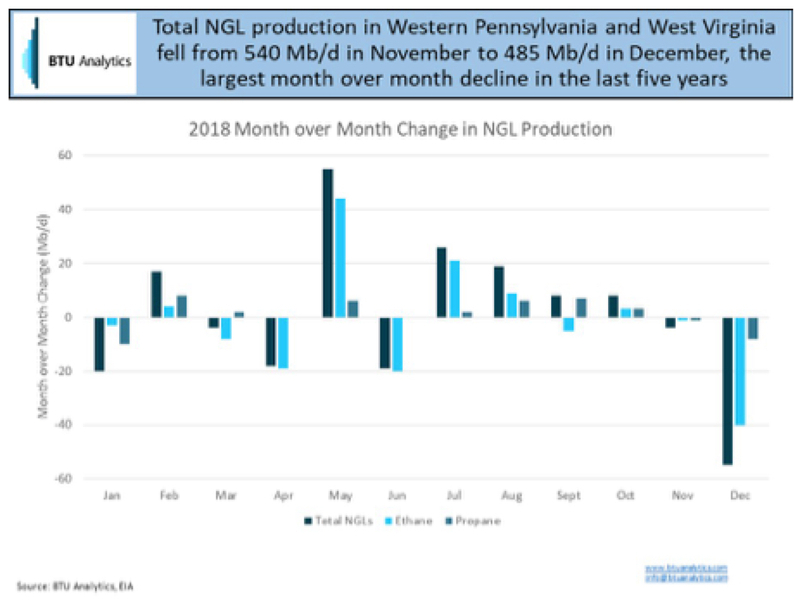 In today’s energy market commentary, BTU Analytics will review the outages, discuss producer drilling trends in liquids-rich acreage, and potential implications to supply if repairs and construction on Mariner East I and II continue to be delayed. First starting in December, operations at MarkWest’s Harmon Creek and Houston gas processing and fractionation facilities were curtailed due to operational issues. Then, a sinkhole appeared in the right of way for Energy Transfer’s (NYSE: ET) Mariner East I NGL pipeline, exposing the pipeline in Chester County. Mariner East I pipeline has been idled in response and service will not resume until the Pennsylvania Public Utility Commission concludes an investigation into the cause of the sinkhole and allows flows to resume. The third event impacting Appalachia supply was an explosion on TETCO. The explosion reduced a critical takeaway option for producers exporting gas from Appalachia, particularly rich gas producers. Unlike other regional pipelines, TETCO offers producers the ability to blend away excess ethane. The blending occurs on TETCO because TETCO grants a waiver on gas quality. 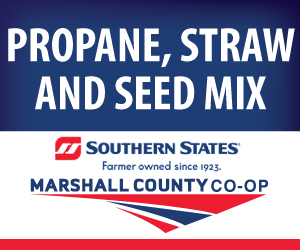 The waiver allows shippers to deliver gas with a heat content of 1,200 BTU/Mcf. Typically; a pipeline only accepts gas with heat content below 1,100 BTU/Mcf. Thus, an outage on TETCO in tandem with a constrained NGL ethane takeaway impacts producers throughout the region. Flows on TETCO are not expected to return to levels seen prior to the explosion until late April or early May. As a result of the outages, Southwest Appalachian natural gas production has flattened in the last few moths as highlighted in the chart below. 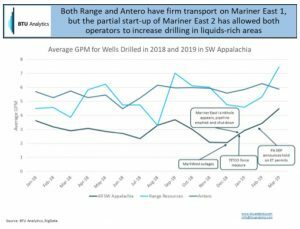 One would expect that due to processing constraints and the loss of Mariner East I, drilling activity in Southwest Appalachia would shift away from liquids-rich areas, but for key operators like Range and Antero we haven’t seen this shift yet. By mapping wells drilled against BTU Analytics’ GPM (gallons of NGLs per Mcf of gross gas) content maps from our E&P Positioning Report; we are able to analyze trends in the NGL content for newly drilled wells. This analysis highlights that producers are following through with their plans to shift towards liquids-rich acreage, as shown in the graphic below. 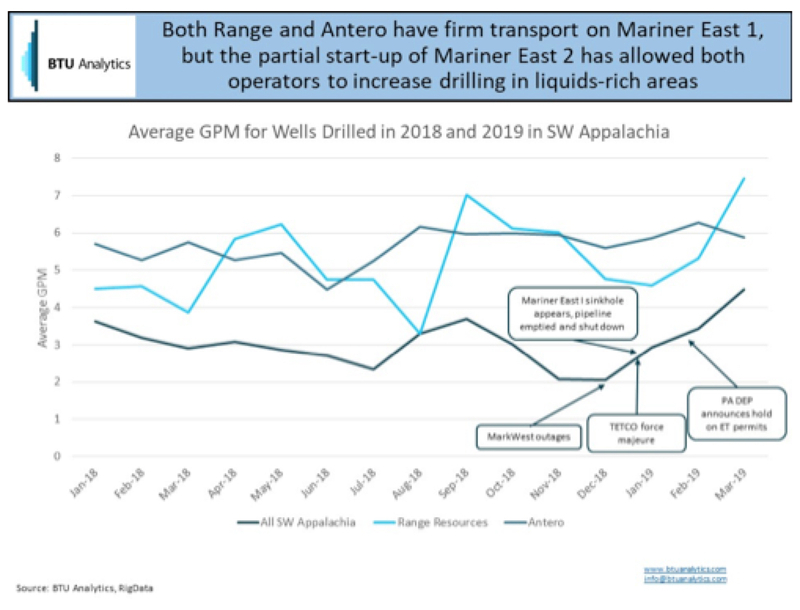 The shift towards higher GPM acreage could spell trouble for Southwest Appalachia operators with Mariner East I out of service and Mariner East II’s remaining construction in regulatory limbo. Range Resources and Antero are two of the largest NGL producers in Appalachia and anchor shippers on the two NGL pipelines. Range’s average GPM increased from 4.75 in December to 7.44 in March. Both Range and Antero’s average GPMs are higher than the regional average. Capacity on the first phase of Mariner East 2 has allowed both Range and Antero to avoid the immediate impacts of the loss of Mariner East I as propane volumes were shifted to the Mariner East II capacity. In February, the Pennsylvania Department of Environmental Protection issued a notice to Energy Transfer that the PA DEP would halt permit approvals for Energy Transfer pipelines due to non-compliance. The PA DEP has not yet announced that the suspension is lifted. Energy Transfer expects to restart construction early this month on the portions of Mariner East II that do not require new permits. However, if full completion of Mariner East II is delayed, Appalachia operators could face production constraints limiting growth in NGLs. 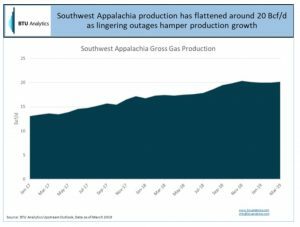 We have seen in the past four months how sensitive Southwest Appalachian production is to relatively small infrastructure constraints. To learn more about BTU Analytics’ outlook for natural gas and NGL production, request a sample of our Upstream Outlook. Trump’s Executive to Help Pipelines. President Trump today will sign an executive order designed to prevent states from blocking pipelines and other energy infrastructure by using authority they feel is afforded them under the federal Clean Water Act, Kallanish Energy reports. Under Section 401 of the Clean Water Act, companies must obtain certifications from a state before they can build federally-approved infrastructure, like pipelines, within that state’s borders. States can refuse to issue the certifications if they determine the project will have a negative impact on water quality within their jurisdiction, even if the project has been approved by the Federal Energy Regulatory Commission. Republican lawmakers have accused Democrat-controlled states of abusing their power under Section 401 to block Ferc-approved infrastructure tied to fossil fuels. New York has refused to issue a water permit to the developers of the Constitution Pipeline, a 125-mile project that would transport natural gas from Northeast Pennsylvania to the New York City area. The new executive order will direct the Environmental Protection Agency to review its existing guidance on Section 401 to states. The EPA will focus on making sure states exercise their authority consistent with the intent of the statute and with existing case law, a senior administration official told Reuters. The official said that while many states implement the law “faithfully,” others have exercised their power in a way that has delayed energy infrastructure projects. The same presidential order also calls for a review of safety standards for liquefied natural gas export terminals and rules that prevent LNG from being transported by rail car. It also orders the Department of Labor to review existing guidance on fiduciary responsibility related to energy infrastructure investments. And it tasks the Energy and Transportation Departments with preparing reports on limitations to transporting natural gas to the Northeast and West Coast. Trump Wants to Allow NatGas to Be Shipped by Rail. President Donald Trump wants to allow natural gas to be shipped in railroad cars, a move that would open new markets hungry for the fuel but could risk catastrophic accidents if one were to derail. LNG does not burn on its own, and it can’t ignite in its liquefied state. The risk comes if a tank car was ruptured and LNG was exposed to the air, triggering the LNG to rapidly convert back into a flammable gas and evaporate. Millar warns that LNG is especially hazardous because of its ability to easily warm to a vigorous boil, forming a flammable gas cloud that can erupt into an unquenchable fire. A 1944 explosion in Cleveland killed more than 100 people after liquefied natural gas from an East Ohio Gas Co. storage tank seeped into the city’s sewer system and ignited, leveling homes and businesses across several city blocks, he said. However, supporters of rail transport stress that natural gas dissipates rapidly and has such a narrow ignition window it is only able to ignite when mixed with air at a ratio of about 5 to 15 percent, unlike other flammable materials carried by rail. LNG won’t dissolve in water and, if spilled, generally evaporates, leaving no residue behind. “It’s really hard to even get it to ignite to begin with in a gaseous format, let alone in a liquid format,” the Center for Liquefied Natural Gas’s Riedl said. The Association of American Railroads emphasizes that LNG is “similar in all relevant properties to other hazardous materials that are currently authorized to be transported by rail.” Besides crude oil, hydrogen chloride and other liquefied gases are now widely transported over American train tracks. There have been only two accidental releases of cryogenic liquids approved for U.S. rail transport in DOT-113 tank cars in the past 16 years, the association said in a 2017 petition asking regulators to allow the LNG shipments. Railroad group representatives did not respond to emails requesting comment. “The record reflects that railroads transport cryogenic liquids very safely,” and “rail is undeniably safer” than transporting LNG in trucks, the group said. Trains already move some liquefied natural gas in North America. The Obama administration in 2015 authorized the Alaska Railroad Corp. to ship LNG using portable containers on flatcars. Canada’s transportation department also allows LNG to be shipped in DOT-113 tank cars. The policy change could expand existing gas markets and open up new ones. A prime opportunity is creating a new avenue for getting natural gas to New England, where high winter demand and limited pipeline capacity have caused prices to rise sharply and lured cargoes from Russia. The railroad association said some shippers are interested in transporting LNG by rail from the prolific Marcellus shale formation in Pennsylvania to New England, as well as on routes between the U.S. and Mexico. Rail shipments could out-compete other sources of LNG in the region, analysts said, even factoring in added costs to liquefy natural gas and transport it in tank cars. New England imported six cargoes of LNG at an average price of $8.88 per million British Thermal Units in January, even though the same quantity of Appalachian natural gas traded at $3.25. Highest Ever U.S. Oil Production. 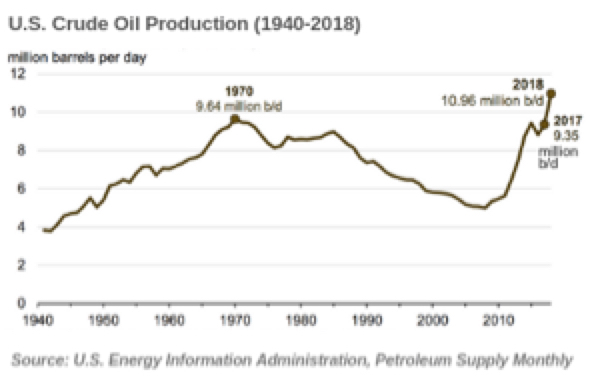 Annual U.S. crude oil production reached a record 10.96 million barrels per day (Mmbpd) in 2018, 1.6 Mmbpd (17%) higher than 2017 levels, the Energy Information Administration reports. In December, monthly U.S. crude oil production hits 11.96 Mmbpd — the highest monthly level of crude oil production in U.S. history, Kallanish Energy learns. “U.S. 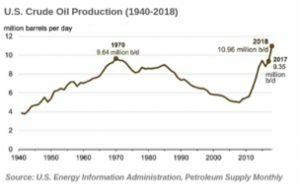 crude oil production has increased significantly over the past 10 years, driven mainly by production from tight rock formations, horizontal drilling and hydraulic fracturing,” EIA states. EIA projects U.S. crude oil production will continue to grow in 2019 and 2020, averaging 12.3 Mmbpd and 13.0 Mmbpd, respectively. Texas continues to produce more crude oil than any other state or region of the U.S., comprising 40% of the national total in 2018. Texas has held the top position in nearly every year since 1970. The exceptions are 1988, when Alaska produced more crude oil than Texas, and from 1999 through 2011, when production from the Federal Offshore Gulf of Mexico region was higher. Texas crude oil production averaged 4.4 Mmbpd in 2018, and reached a record-high monthly production level of 4.9 Mmbpd last December. Texas’s 2018 annual production increase of almost 950,000 barrels per day — driven by significant growth in the Permian Basin in West Texas — was nearly 60% of the total U.S. increase. 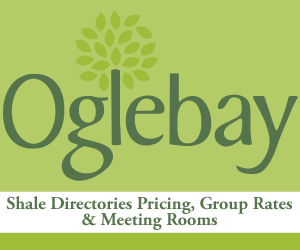 Several other U.S. states or regions set production records in 2018. Growth in the Permian, which spans West Texas and southeast New Mexico, also drove a 215,000 Bpd, or 45%, production increase in New Mexico. This level was the second-largest state-level growth in 2018 and accounted for 13% of the total U.S. increase, setting a new annual record production level in New Mexico. Production levels in Colorado, Oklahoma, and North Dakota each grew by more than 95,000 Bpd from 2017 to 2018. In Colorado and North Dakota, this increase was enough to set new record production levels for the year. Increases in these states and regions were enough to offset production declines elsewhere. Alaskan production fell by 16,000 Bpd, and California’s production dropped by 13,000 Bpd, the state’s fourth consecutive annual decline. Equitrans – EQT Pipeline Deal. 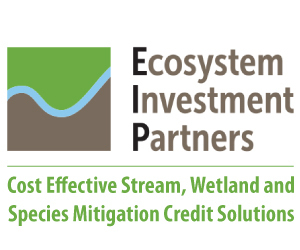 Equitrans Midstream Corp. and EQM Midstream Partners announced EQM has completed the acquisition of a 60% interest in Eureka Midstream Holdings LLC and a 100% interest in Hornet Midstream Holdings for a total $1.03 billion, Kallanish Energy reports. The deal had been announced last month. The deal with Morgan Stanley Infrastructure Partners included $860 million in cash and roughly $170 million of assumed pro-rata debt. EQM also closed on the private placement of $1.2 billion of newly issued Series A Perpetual Convertible Preferred Units. “We are pleased to have completed this important acquisition and our team is excited to begin integrating the Eureka and Hornet systems and levering our existing assets and core operating capabilities,” said Diana Charletta, chief operating officer of EQM, in a statement. “These value-enhancing assets will diversify our producer customer mix and increase exposure to wet Marcellus acreage, expand our supply hub and create additional commercial opportunities, reduce unit operating costs through increased scale and accelerate opportunities for our water services business,” she said. Eureka Midstream is a 190-mle gathering header pipeline system in Ohio and West Virginia that serves both dry Utica and wet Marcellus production. Hornet Midstream is a 15-mile, high-pressure gathering system in West Virginia that connects to the Eureka system. The deal is the first by Pittsburgh-based EQM since it spun-off from EQT Corp. The deal’s assets averaged roughly 1.6 billion cubic feet per day (Bcf/d) gathered volume during Q4 2018, with minimum volume commitments (Mvcs) of 0.8 Bcf/d, growing to 1.3 Bcf/d by 2021. Volume mix is 67% dry gas and 33% wet gas, with roughly 200,000 acres dedicated in core Marcellus and Utica Shale plays. Liquid Pipeline Incidents Decrease by 20%. Liquids pipeline incidents impacting people or the environment have decreased by 20% over the last five years in the U.S. while pipeline mileage and barrels delivered have both increased by more than 10%, Kallanish Energy reports. That assessment came Monday in a new report from the American Petroleum Institute and the Association of Oil Pipe Lines (Aopl). “The natural gas and oil industry continues to demonstrate that safety is our number one priority, with pipeline incidents declining over 20% in the last five years,” said Api pipeline manager Mark Murk in a statement. “Government data captured in this report shows how liquids pipelines are getting safer with fewer pipeline incidents impacting people or the environment,” said Andy Black, president and Ceo of Aopl. The data came from the U.S. Department of Transportation’s Pipeline and Hazardous Materials Safety Administration. According to the data, pipeline incidents impacting people or the environment caused by incorrect operation are down 38% over the last five years (2014-2018). In those five years, pipeline mileage has grown by 12% and barrels of product delivered grew by 44%. Huntley & Huntley in Westmoreland County. Huntley & Huntley continues to make Upper Burrell in Westmoreland County, PA a key area of focus. In January we told you about H&H’s plans to add two more well pads in Upper Burrell, numbers 10 and 1. And now, just a few months later, yet another new H&H well pad is being planned–number 12.